WSU Food Systems Program and Tilth Alliance have been collaboratively presenting the FARMWALK series for 15 years! These farmer-to-farmer educational events are hosted on innovative farms throughout Washington State. Check out our latest offering below! This entry was posted in Event Announcements on November 19, 2018 by sonia.hall. This entry was posted in Event Announcements on August 31, 2018 by sonia.hall. Beginning Thursday, July 12 at 9:00 am Pacific Standard Time – and occurring weekly at that time through Tuesday, August 28 – the OneNOAA seminar series will be hosting an 8-part suite of talks on different aspects of the National Climate Assessment 4 Volume I – the Climate Science Special Report. This is a fantastic opportunity to learn about the latest climate science from some of the nation’s most eminent scientists! This entry was posted in Carbon & Soil Organic Matter, Climate Modeling, Event Announcements, Greenhouse Gas Emissions, Impacts & Adaptation, Sustainable Practices, Variability, Weather, & Extreme Events on June 1, 2018 by AgClimate Admin. 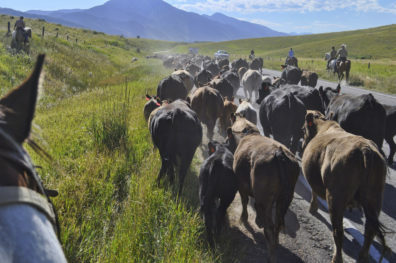 Cow-calf operators, the primary users of rangeland resources throughout the Pacific Northwest, will need to adapt to a range of future stressors, including those that are climate-related. A critical aspect of preparing for the future is understanding past vegetation performance and management responses. Learning from successful techniques for dealing with extended drought or reduced forage conditions can add insight to the future. Thus, as part of this project, we use case studies to quantify decadal trends and inter-annual variability for rangelands to aid managers and producers in planning for the future. We also profile forward-thinking grazers to provide stakeholder-centered and science-driven insights into their management practices to enhance resilience. This entry was posted in Event Announcements on May 21, 2018 by AgClimate Admin. This entry was posted in Event Announcements on May 15, 2018 by sonia.hall. How will climate change affect pests of inland Pacific Northwest cereal systems? This entry was posted in Event Announcements, Impacts & Adaptation, Sustainable Practices on December 12, 2017 by AgClimate Admin. This entry was posted in Event Announcements, Impacts & Adaptation, Sustainable Practices on December 9, 2017 by AgClimate Admin. This entry was posted in Event Announcements, Impacts & Adaptation, Sustainable Practices on December 1, 2017 by AgClimate Admin. This entry was posted in Event Announcements, Impacts & Adaptation, Sustainable Practices on November 20, 2017 by AgClimate Admin. The National Climate Assessment is a U.S. government interagency report that summarizes the impacts of climate change on the United States, now and in the future. These reports are extensively reviewed by the public and experts, including federal agencies and a panel of the National Academy of Sciences. The draft report has been completed, and is now available for public comment. You can review and comment by visiting review.globalchange.gov before Jan 31! Here’s the associated Federal Register Notice. This entry was posted in Event Announcements, Impacts & Adaptation, Variability, Weather, & Extreme Events on November 17, 2017 by AgClimate Admin.